What are Digital Humanities, anyway? Professor Constance Crompton’s research interests include queer history, Victorian visual and popular culture, prosopography, the semantic web and code as a representative medium. The field of digital humanities can be a confusing one. We sat down with Professor Constance Crompton, who holds the Canada Research Chair in Digital Humanities at the Faculty of Arts, and asked her to help us out. In the digital humanities, we use computers to help further humanities knowledge. Digital technology lets us both ask and answer questions that we couldn’t otherwise tackle. For example, one individual can’t read 5,000 books written during the 19th century, but we can use algorithms to look for patterns and trends to help us better understand cultural shifts and innovations that took place during that time period. We can also use digital visualizations to show connections between people that would be hard to express in written form. We can create digital exhibits that bring together rare and unusual items online, featuring items that could never be showcased next to each other in the real world. 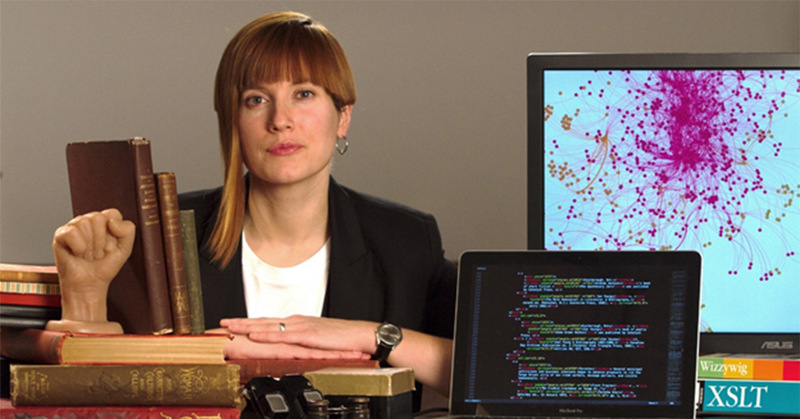 Why is the study of digital humanities important? The humanities have a history of tackling complex questions that continue to shape our day-to-day lives, such as how to mitigate the effects of xenophobia or racism, or how to ensure a flourishing democracy. It’s important to bring a humanities perspective to the development of technology, artificial intelligence and media, but it’s also important to bring digital tools to humanities questions. The humanities – and the arts in general, which include history, philosophy, literature studies, communication, fine arts and more – help us understand history and how to create effective change. The application of digital tools to humanities research, and of humanities research to the development of the digital world, is very powerful. Professor Crompton and her students built dynamic network graphs to explore Canadian gay history. What advice would you give students heading into digital humanities? It’s a really good discipline if you’re into creating things as a way of really getting to know them. My recommendation to those who are curious about digital humanities is to lean in and build your tolerance for iteration as you build things that draw on your arts and humanities research skills. Take a DH class, go to a workshop, join a faculty member’s research team. Why is Ottawa a great place to work in this field? This is an amazing city. The University of Ottawa is a pioneer in the field — it had one of the earliest digital humanities labs in Canada. It has all sorts of great DH activities, including an undergraduate minor, a lecture series, and workshops hosted by the Library. Most universities that offer digital humanities programs offer them only to graduate students, but uOttawa gives you the opportunity to study the subject as an undergrad. Furthermore, Ottawa is home to all sorts of institutions and events that offer great opportunities for students to do digital humanities-related work, including Library and Archives Canada, the Canada Science and Technology Museum, Hacker Nest socials, Start-Up Weekend and more. There’s all this great digital humanities synergy here! Professor Crompton believes that digital humanities can help us understand the past to effectively change the present and thus create a better future.